the co-founders and investors a significant return. 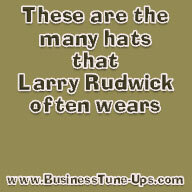 In the year 2000, I met Larry Rudwick, a member of a group that invested in a biotech business that I co-founded (BioFX Laboratories, Inc.). In 2003, our firm hired Larry as a consultant; he was involved in analyzing various issues including sales, marketing, production equipment, software and general management. At that point, our company had a large loss carry-forward and just had become marginally profitable. 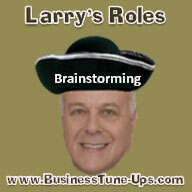 After his analysis, Larry encouraged various Board Members to make changes in key management. Subsequently, the Board of Directors selected me as CEO to "turn the company around" and guide it in new directions. I had previously been working as the Chief Scientific Officer of the company (partly off-site). Since then, our sales and profits greatly increased. 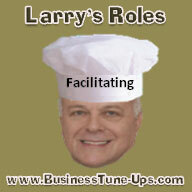 Larry gave me some good guidance when I started in this position, including helping to re-organize our sales and marketing efforts. The company's cash flow and success attracted a number of suitors, and recently BioFX was successfully acquired by a public company in our industry. The deal was extremely beneficial to investors and the founders. I feel Larry's help contributed to our success. Dr. Charles Hewitt, former CEO • BioFX Laboratories, Inc. I wish to thank you Larry, for getting me on track and focused on my goal of becoming a successful songwriter. Our initial consultation allayed any doubts I had as to your ability to help me in my career. Your insights into what I needed to do to were right on target. Before I started consulting with you I was not organized and easily distracted by many interests. With your help and expert analysis I was able to find the area with which to concentrate my efforts in order to be successful. I feel like you have given me the tools and confidence to proceed along this career path, and the enthusiasm to enjoy the work involved. It is comforting to know that you are there to help maintain my focus. It has been an absolute pleasure to have you to guide me and I look forward to continuing our business relationship. Please feel free to use my comments in any format. I can't thank you enough for creating the opportunity for me to really see what it is that I wanted in my life. As I look back to where I was over a year ago and where I am today, I wanted to pay tribute to you, your kindness, sincerity and your professionalism. Your coaching and very powerful questionnaire allowed me to focus on my desire to work in an industry whereI was making a difference while feeling rewarded both emotionally, professionally and financially. Today, I am living that goal and desire and absolutely love my work. In addition, a year after a traumatic break up of what I thought was a perfect relationship, I never thought I would love again. Your drilling down to what it was I felt, gave me the space to identify what my heart yearned. After my professional life began to come together, my personal life also blossomed. My relationships are now richer with my friends and family and I have recently met a man who is healthy and vibrant. It's funny how the power of intention works! Larry, thank you for all you are and all you have done to assist me in getting clear about the abundant possibilities I could create in my life. Please feel free to either publish this anyway you wish and/or I would be delighted to speak with anyone who may be considering using your services. 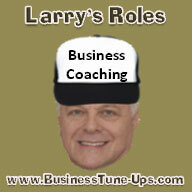 Barter Systems, Inc. has been working with Business Tune-ups for over a year now and have found that Larry is very well organized in his approach to coaching and consulting. He has come up with many website changes that we have implemented that seem to have an added benefit and clarity to our client's online BSI website experience. Also, he has been helpful in coming up with some needed changes to our incentive program both with our in-house staff and our clients. 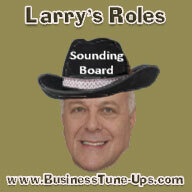 We will continue to use Business Tune Ups (Larry). Barter Systems, Inc. I am grateful for having had the opportunity to meet Larry a couple of years ago, when I was making the transition back into the business world after four years of teaching Social Studies and Special Education at an urban high school. We met in person and followed up with a few conversations, during which Larry gave me some practical advice that kept me moving in the right direction. 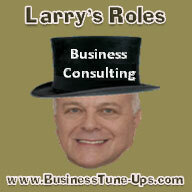 While the process of changing and redirecting oneself is never-ending, Larry played a very positive role in my making a huge career leap to an Education Consultant and IT Project Manager within a year and a half's time. His experience taking risks and developing successful organizations helped inspire me to action, and his down-to-earth demeanor made it easy for meto talk to him about personal challenges. 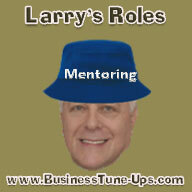 Moreover, Larry's smart (both "ivory tower intellectual" and everyday streetwise) approaches to life make him a good listener and a confident advisor. I'll look forward to connecting with Larry again in the future.